Hello everyone, and welcome to the 56th Carnival of Space! My name is Darnell Clayton (of Colony Worlds) and welcome to the Lifeboat Foundation, a not-for-profit organization dedicated to preserving civilization upon our fragile world (as well as expanding it off world if all else fails). Feel free to explore around the site, and if you have any questions, do not hesitate to ask. Now without further ado, here is the Carnival of the Space Geeks! Earthlings have caught a case of Mars fever, and the only cure is more images from Phoenix! After NASA’s successful touchdown upon the red planet’s Northern pole, the Martian lander is capturing the attention of the media, not to mention the awe of the masses. The Bad Astronomer goes into depth about what is so inspiring about Phoenix’s decent, while Dynamics of Cats displays the stunning images of Phoenix’s drifting into the Martian atmosphere. Ian over at Astroblog was able to include his kids names within the Phoenix lander’s DVD (note: I’m jealous), while the Planetary Society provides informative highlights about the mission overall. Update: It looks as if one individual had to choose between sleep and rediscovering Mars through Phoenix’s “eyes,” and it looks as if Phoenix won. For those of you wondering why scientists are “jumping for joy” over the dusty polygons, the Martian Chronicles will enlighten you, while the mysterious Professor known as AstroProf gives a short lesson about Martian days. Despite the excitement surrounding Phoenix, collectSpace notes the lander lacks its own action figure (note: yes, even rovers have action figures), and Brian Dunbar of Space For Commerce “lays the smack down” against Phoenix nay-sayers. 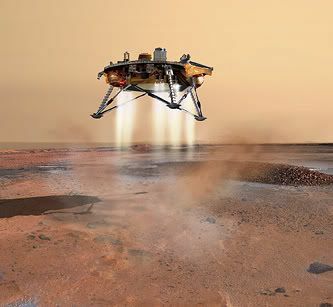 Even though Phoenix has just arrived on Mars, its life on the red planet may be short lived as few think the lander will survive the cold, dark winters upon the North Pole beyond September (as the craft needs solar power in order to function). But just in case the craft emerges unscathed, the lander may be able to “resurrect itself” back from the brink, an item Chris Lintott highlights. David Portree discusses JPL’s past focus of landing Martian rovers (as well as returning Martian soil to Earth), while Discovery News provides even more updates regarding the Martian lander. For those of you tired of hearing about landing robots on Mars braving the new frontier, Universe Today has another suggestion: why not send the troops instead? Moving on, readers may want to rest their eyes and focus their ears upon listening to Tom Hanks discuss From Earth to the Moon, with video entertainment being provided by Space Feeds. Done watching the video? Great! Now you can enjoy Brian Wang’s articles reporting on some upcoming breakthroughs in cold fusion and fusion power, which may be useful for future space craft (not to mention space settlements). Meanwhile Music of the Sphere discusses about the possibilities of other advanced civilizations arising in our galaxy, while Centauri Dreams focuses on humanity finding another Earth like world. Update: Speaking of finding other worlds around other stars, new technology (such as Microsoft Worldwide Telescope) is enabling the average person as well as the professional astronomer to scan the heavens in search of stars (whether big or small). In order to take advantage of this, Rob (via Orbiting Frog) enlightens us to an upcoming Astronomy Conference called Dot Astronomy, which teaches both novice and expert astronomers on how to use these “geek toys” to promote astronomy towards the public. You can pre-register over here. Catholic Sensibility has some interesting news about how stars (and even massive planets) affecting Nebulae, while Ian of AstroEngine reports on the shutdown of the world’s largest satellite Earth station. Thanks for reading the latest edition of the Carnival of Space! For those of you seeking to submit a space related article into the next round, you can visit Universe Today for the necessary details on how to enter. Update: Replaced image of Phoenix Lander. Update 2: Additional links added (they were accidentally left out). PS — could the Phoenix landing rockets have “burned” the Mars’ life it’s gone there to search around itself? there must be a law to prevent that. Most of whatever you point out happens to be astonishingly legitimate and that makes me wonder why I had not looked at this in this light previously. This piece truly did switch the light on for me personally as far as this specific issue goes. Nonetheless there is one particular position I am not necessarily too cozy with and while I attempt to reconcile that with the actual core theme of your position, allow me observe exactly what all the rest of your subscribers have to point out.Very well done. Blogging is a very time-consuming business model, no question about it. Finally! Facts in order to back-up the things i have actually been practising and telling my friends. Glad I came across this post and shall definitly end up passing this data onto others. Precisely what genuine scientific studies is the actual information based on, the more aspects the better. Thanks for your precious time.